Brodi Ashton: Does Anyone know what Periwinkle even looks like? We were supposed to wear purple. I'm lucky if I find non-black in my closet, let alone purple. But in the fashion of a Christmas Miracle, I found a purple shirt to wear. Emily Wing Smith accused me of lying: "You can't possibly think that shirt is purple!" Bree Despain complimented me: "What a lovely shade of lilac. I'm just happy you came." Sara Bolton corrected her: "That's not lilac. If it's anything, it's periwinkle." Sara's husband Ben (of the infamous fish v. amphibian debate) said: "I'm gonna wikipedia the arse off that shirt." Kim Reid said: "At least you tried to wear non-black." James Dashner accused me of being color-blind. He's all, "I've seen aliens with more color smarts than you." I'm not surprised. Everyone knows that if aliens found their way to earth, they would be on a higher plane of intelligence, including a deeper understanding of the color wheel. I told everyone: "It's Frakkin' purple! Who even knows what periwinkle looks like?" Valynne (our group's bouncer) threatened to throw me out for such lies. I'll do a longer post later on the evening's festivities. For now, enjoy the Silent Monks, singing the Hallelujah chorus. I will give you credit for at least trying to wear purple. I think you are in need of some assistance from the sartorial adviser. Hey, Brodi told me that I was wearing a purple shirt too until everyone at the party politely told me that I was wearing blue. And fwiw, everyone at the party thought that I was very classy. Also, I think its cool that I am now a bff of Mr. Dashner. You dared me: http://en.wikipedia.org/wiki/Periwinkle_(color). Sam may need to come defend your honor again, but I'm gonna have to side with the revered James Dashner and say you're color blind. I do give you props for having a classy husband though. Valynne- Do you know any good sartorialists? Sam- James asked me if I could set up a playdate. You guys really are bff's now. Ben- I knew you'd come through on the wikipedia thing! If you'll notice on the link you posted, periwinkle is in the family of blue-violet. VIOLET. Yes, I do know what periwinkle is. It was one of my sister's wedding colors. Do you know how hard it is to find a periwinkle dress when you're six months pregnant? And periwinkle is also a small BLUE flower and a type of snail. The snails aren't blue though. 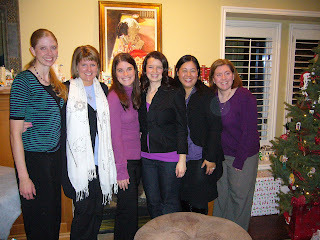 Well Brodi, if you aren't wearing purple, the lady on your right in the picture (stripes) is wearing black and blue, not purple... Plus the human eye can see so many varying shades of blue that some purples look blue to one person while looking purple to another...trust me, I'm an architect, we know color! Plus it says in the wiki, it's LAVENDER blue, correct me if I am wrong but LAVENDER = purple! So it's a blue purple, sounds like it qualifies!! And bless you for the silent monks video, it was fabulous! Thank you! Merry Christmas and Happy New Year if I miss you before then! In your defense though, I would totally have considered that shirt purple. It's only in contrast to the other purples that it looks less purple. Cam- I beg to differ. You know your toffee, but not your shades of obvious purple. Jenilyn- The periwinkle dresses were probably hard to find because when you asked the employees, they were all, "What the Frak is periwinkle? Here, give her a blue dress." Una- Thanks for having my back. And do you pull out this phrase a lot: "Trust me. I'm an architect." Because that is very cool. Heather- exactly. If everyone around me weren't wearing such reddish shades, my shirt would look more purple. Thank you, Jenni. I think that's now 90 votes for purple and 1 vote for non-purple. trust me brodi, i am a graphic designer. your shirt is purple, but not bree-despain-the-dark-divine-purple. i think that is the crux of the problem. it's purple enough to be called purple, but not at bree's party. i've got all of january circled. will purple be required attire then? if so, i'll have to get busy finding the right color of purple so as to not be mocked. Rachel- I like that definition. My shirt was "just purple enough". You should definitely come to the launch party! I promise you will not be mocked. L.T.- It's good to have a purple expert in residence. Thank you! BTW I loved the Silent Monks... it reminded me of your mom. That is so something she could have come up with for a high school assembly. Ree- those were purple? Oh man. I apologize. That is just wrong. So wrong. Definitely periwinkle. Jeff would probably call it purple,though. Jeff is a good man. I trust his definition of purple. After all, he got into like 86 medical schools.